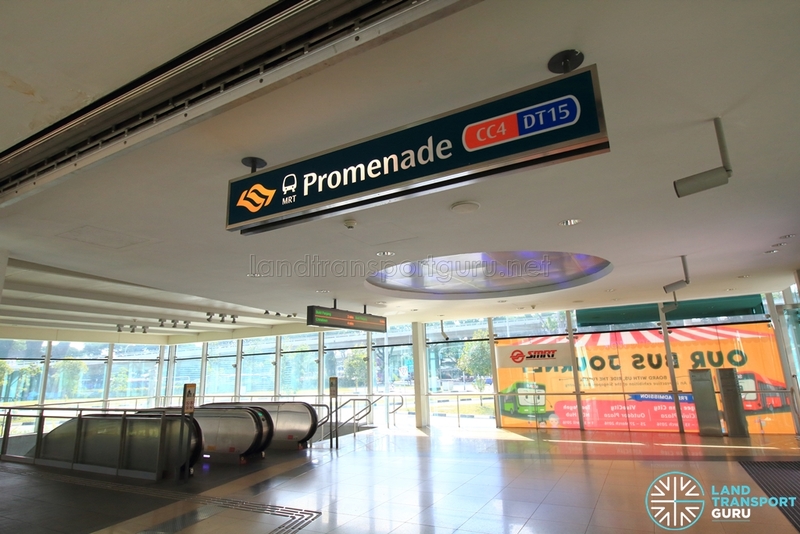 Promenade MRT Station (CC4/DT15) is an underground interchange station located in the Downtown Core (Marina Centre planning subzone), connecting the Circle Line (CCL) and the Downtown Line (DTL), while serving as an interchange between regular Circle Line train services to Dhoby Ghaut and Circle Line Extension train services to Marina Bay via Bayfront. Located underneath Temasek Avenue and adjacent to Millenia Tower, the station brings rail connections to Suntec City and the Marina Centre area, along with attractions such as the Singapore Flyer and the Seating Gallery. It also serves the nearby Marina Reservoir area. The design of the station is unique for an interchange station, comprising four side platforms stacked vertically over multiple floors. The deepest platform is at Basement 7 for Downtown Line train services towards Bukit Panjang, at 43 metres below ground level. Levels B3 and B5 are service floors and not for public access. 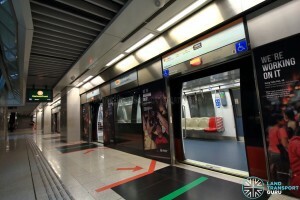 Promenade station has four platforms utilized by both rail lines for trains travelling in either direction, arranged in a four side platforms spanning four separate underground floors, with the Circle Line occupying the upper two and the Downtown Line occupying the lower two. A cross-platform interchange was not possible at this station as the Circle Line makes a very sharp right turn towards Esplanade, interfering with the Downtown Line which heads straight towards Bayfront. Tightening the curve radius to allow the Circle Line to occupy the two currently unused platforms might not have been possible. As a result, the station was opened with an unused tunnel at Basements 2 and 4, where another platform would have been located, and the current Circle Line platforms operated as side platforms with large concourse areas. The Downtown Line side platforms were eventually built underneath the existing Circle Line station in a stacked formation (Basement 6 and 7), with its two tracks located directly underneath the unused platform at Basement 4. 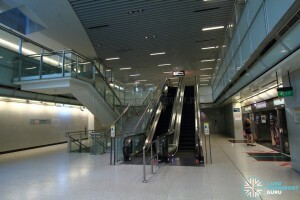 A part of the previously-unused Basement 4 unused platform was used to construct the DTL transfer concourse, where escalators and lifts connect it to the lower DTL platform levels. (There are no direct lifts or escalators to the station concourse; passengers commuting to and from the DTL platform(s) must change escalators or lifts at B4). The thought process behind such constructions are unknown. 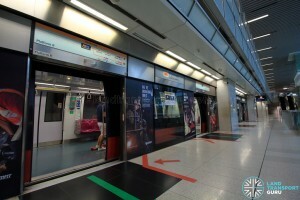 As an interchange station for the Circle Line Extension, Circle Line train services towards Marina Bay will operate as a shuttle between Stadium and Marina Bay stations throughout most of the day. These services will operate every alternate train between Dhoby Ghaut and HarbourFront. 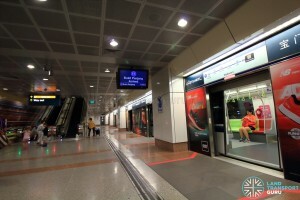 However, during weekday peak hours, train services from Marina Bay will serve the full line, operating between Marina Bay and HarbourFront stations. 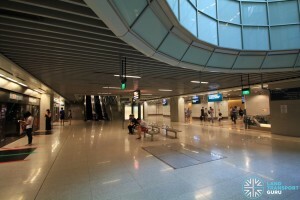 The main concourse at Basement 1 feature faregates for automatic fare collection and provides access between paid and unpaid areas of the station, with at least one bidirectional wide-swinging gate for the benefit of passengers-in-wheelchairs and those carrying bulky items or travelling with prams. General Ticketing Machines allow commuters to purchase tickets for single or multiple journeys, and along Top-up Machines, offer contactless card transactions. Station offices at both CCL and DTL concourses function as Passenger Service Centres and are staffed during operating hours, where commuters may make travel inquiries or perform card transactions using cash payment. 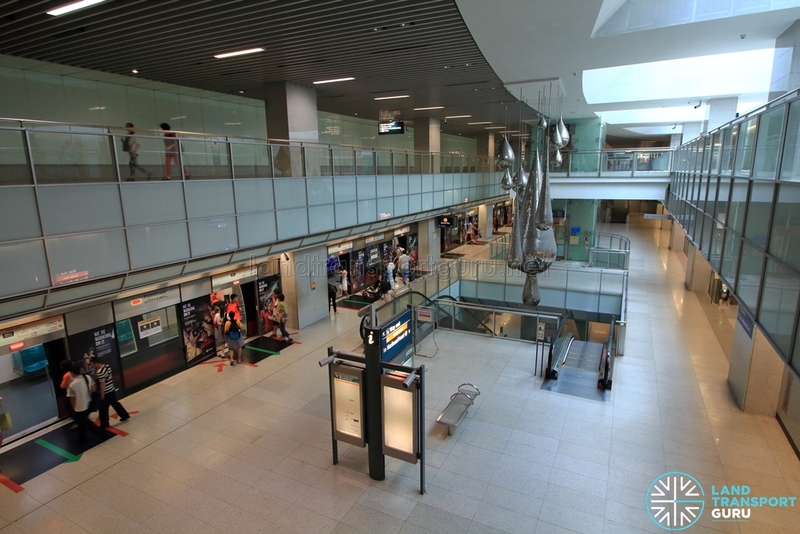 The SMRT station office is located at Basement 1 while the SBS Transit station office is located at Basement 4 (paid area). 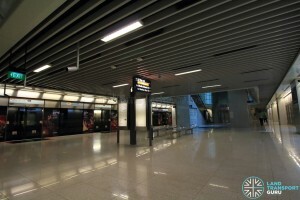 With the DTL platforms built underneath the CCL station, an additional concourse at Basement 4 links the CCL station with the DTL station, where an SBS Transit station office is located. 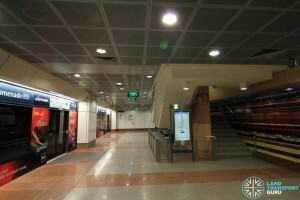 The DTL concourse occupied part of a disused platform opposite of CCL Platform A. 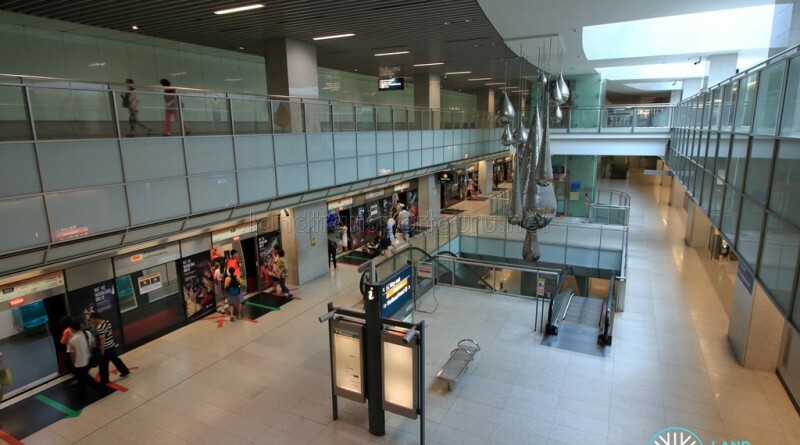 There are no direct lifts or escalators to the DTL concourse; passengers commuting from the CCL concourse at B1 change escalators or lifts at B4. A single convenience store is present in this station. 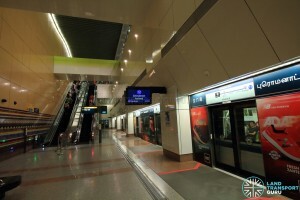 The station concourse has an unpaid link at Basement 1 that allows commuters to use the station’s underground walkways between exits without entering the paid areas of the station. Finally, the station has public toilets located at the Basement 1 concourse level. 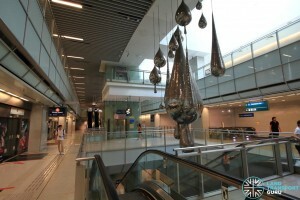 The artwork comprising huge metallic droplets hanging from the ceiling represents an illuminated celebration of collective dreams, cleverly plays with the skylight to illuminate the space with glowing reflections of the light dancing from the water droplets of life, creating a kaleidoscope of patterns on the station floors, walls and ceilings. Analogous to a Promenade usually next to a river or large body of water, it illustrates the interaction between people and society, day and night, sky and water. 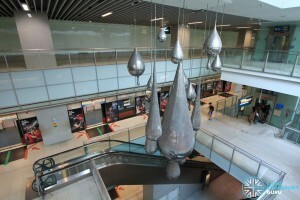 The installation is among the largest artworks installed at MRT stations island-wide. A collage of many coloured strata layers, Earthcake draws analogies to the geology of the Earth and thousand layer cakes commonly seen in Singapore. Exposing the stratification of earth and soil reveals the intertwined strata of thousand-year old soil and a thousand-layer cake, depicting Singapore’s food culture and its connection to its history and culture. Promenade MRT station has three exits at ground level (A, B and C), of which Exit B is inaccessible to the disabled. Lifts at Exits A and C provide barrier-free accessibility for the disabled. Promenade station connects to several bus stops in the vicinity, as well as taxi stands and passenger pick-up points at selected exits. There are two official bus stops linked to Promenade station. Other bus stop(s) are shown here to better reflect transport connections nearby. In addition, passengers can board regular bus services at bus stops officially linked to Promenade station for free rides. Serving dense commercial, retail and hotel developments in the Marina Centre area along with tourist attractions, Promenade sees frequent commuter traffic throughout the day. 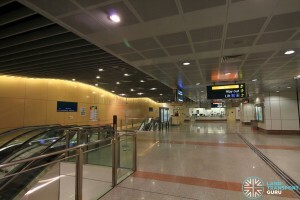 As an interchange station for the Circle Line extension, the station is also utilized frequently by transfer passengers between both branches of the line. Circle Line Stage 1 (CCL1) Contract 825 for the construction and completion of Dhoby Ghaut, Bras Basah, Esplanade and Promenade Stations (then known as Museum, Convention Centre and Millenia stations) and tunnels was awarded to local, Chinese and Sweedish companies Woh Hup-Shanghai Tunnel Engineering – NCC Joint Venture. The working name for Promenade station was Millenia Station. Downtown Line Stage 1 (DTL1) Contract 902 for the Design, Construction & Completion of Promenade Station and Associated Tunnels was awarded to Chinese company Shanghai Tunnel Engineering Co. Ltd. for approximately S$231 million in Aug 2008.